The Nutcracker ballet is a well-loved classic among dance performances. Although the ballet was composed by Tchaikovsky in 1892, the original story comes from The Nutcracker and the Mouse King by E. T. A. Hoffmann. The ballet starts with the Stahlbaum family, including the children Clara and Fritz, preparing for their big Christmas party. As guests enter the home, lively dancing begins around the large Christmas tree. However, when Herr Drosselmeyer arrives with gifts for the children, all attention turns to him. Clara's gift is a beautiful Nutcracker, and she dances with him. Fritz is jealous of her new toy, and ends up breaking it while playing around with the other boys. Luckily, Herr Drosselmeyer saves the day by repairing the Nutcracker, and Clara makes a bed for him under the Christmas tree. That night, Clara falls asleep under the tree with the Nutcracker. When she awakens at midnight, she faces a strange scene. The tree seems to be growing, giving the impression that she is shrinking. And in fact, she is soon confronted by an army of mice led by the Mouse King. As other playthings come to life, the Nutcracker leads a battalion of toy soldiers to defeat the mice. They only succeed when Clara jumps into the fight, hitting the Mouse King in the head with her slipper. The magical atmosphere continues as the Nutcracker is transformed into a Prince and Clara becomes a young woman traveling by his side to magical lands. The first stop on their journey is a snowy wonderland where snowflakes dance for them. However, the highlight of their voyage is the Land of Sweets. As the name suggests, the landscape is composed of sugary delights. Here, they meet the Sugar Plum Fairy. After hearing of their bravery in the fight against the mice, she treats them to a selection of dances in her court. These dances have an international flavor, with Spanish, Arabian, and Chinese influences. After everyone else performs, the Sugar Plum Fairy dances a pas de deux accompanied by what is perhaps the most widely recognizable piece of music from The Nutcracker ballet. At the end of the story, Clara wakes up under the Christmas tree with the Nutcracker in her arms, leaving the audience to question whether it was a beautiful dream or a magical reality. Although this is a basic overview of the story, variations exist. For instance, during the dances in The Land of Sweets, some performances highlight the food aspect in costuming and names, calling the Spanish dancers Chocolate and the Chinese dancers Tea. The Pacific Northwest Ballet adds a prologue and doesn't have Clara fall asleep under the Christmas tree. Some performances include musical variations on some of the most popular themes. However, even in the midst of changes, the classic story shines through. Watching a performance of The Nutcracker is a holiday tradition for many families. With its combination of classical melodies and magical themes, it offers something for everyone. 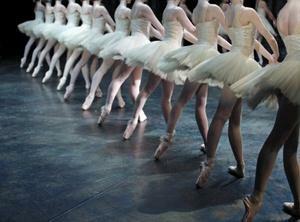 If you're looking for a large-scale production, the New York City Ballet offers an annual performance. However, local ballet companies are just as likely to put on a production. In fact, if you have a young dancer in your family, local productions will often use children in the roles of mice. Ask your nearby venue for a performance schedule. If you can't make it to a live performance, The Nutcracker is also available on DVD. A filmed version of a 1977 performance features famous dancer Mikhail Baryshnikov. George Balanchine's The Nutcracker brings the New York City Ballet to your living room.